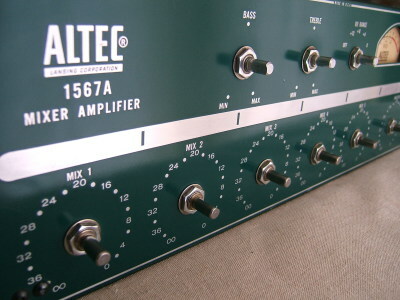 Thank you for viewing some of the various Altec vintage tube products which have been refurbished through our services. As a refurb project, all solder trees and connection points are cleaned thoroughly down to the substrate metal, a new part properly positioned, and new solder flowed in, [essentially an unbuild, rebuild process]. We do not simply clip off old parts and tack new ones on. In this way the signal path is now of new and clean conductive material, keeping signal path length to a minimum, supported by invested time and labor, resulting in the best sound possible, very evident following the work. Internal power supply wiring method improvements lower self noise as well. The front faceplates are not just merely cleaned, but rub-out polished and carnauba waxed to return to original luster and gloss-- nearing a museum quality result! 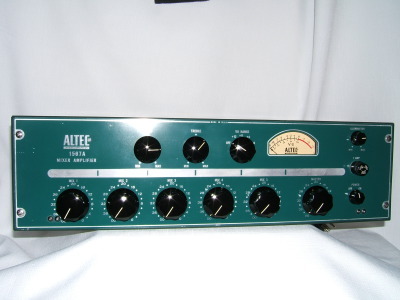 For details regarding services toward your Altec item, please call Vintage Loop at ph. 586-786-1767. All elements of the unit are addressed as a full (non-piece meal) comprehensive service: signal path capacitors, filter capacitors, power supply parts and rebuild, controls cleaning, wiring changes to reduce internal radiated noise, reglaze control knobs, polish and clean faceplate, replace hardware (where possible). New tubes are EXCHANGED for a complete new set as a core exchange. If no tubes are supplied, there is a tube set charge. [No- longer- manufactured significant passive components such as transformers are not part of the refurb process within the base cost]. High quality polypropylene, electrolytic, and tube parts are installed. Our services for Altec tube circuit products are limited to the Altec 1567A, 1566, 438 A-C, 436 A-C... please call ph. 586-786-1767 for a phone price quote pertinent to specific services required for your Altec item. All units must be sent in for us to perform work required. All services require prepaid payment, per price quote, through PayPal or bank cashier's check (payable to: Vintage Loop), accompanying unit on arrival, to keep the process smoothly moving forward. In general units are returned within a 10-day turnaround time-- exceptions and special circumstances can be discussed and addressed. Thank you for your interest in our services!